With persistence, you, too, can reach your goals! Persistence is a thought, a feeling and an action. Each small step you take in the direction of your true life purpose, which is your goal, is persistence. These small steps keep you focused, while also washing away each small obstacle in your way. 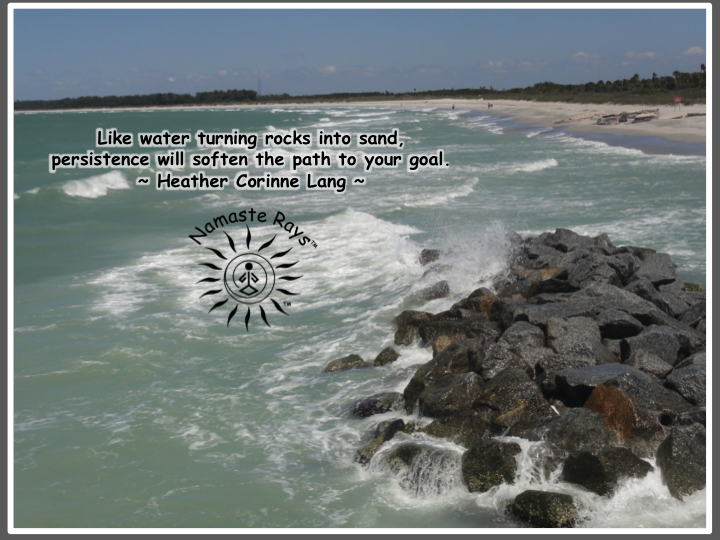 Like water turning rocks into sand, persistence will soften the path to your goal. When you focus your thoughts on solving a problem, you are being persistent. When you feel the joy you have in the solution, even if it is yet to be revealed, this positive imagery is persistence. When you complete a small task on your “to-do” list for your ultimate life purpose, you are being persistent. To achieve our goal, our passion, our true life’s purpose, we need to understand we will not reach it in one large step. That would be like stepping over the Andes in one step, or jumping the Grand Canyon in one jump. Baby steps are the key to accomplishing your goals, to walking your path and discovering the journey your soul is meant to be on. The path will be revealed to you as you investigate your passions and find your inner truth. Someone asked me recently “how did you awaken?” This question lit my soul on fire! Talk about SHINING! I’ve discussed parts of my journey with others and here on Namaste Rays News and my Facebook page, FB/NamasteRaysNews.Sunshine. Briefly, I had a challenging experience with my ex-husband over 15 years ago. I decided I needed to get healthy. I went to yoga. I noticed as I became healthier with yoga, I started to shine. I worked with a health nutritionist. Others noticed and came to me with questions about yoga, health, dream analogy, and more. Someone once told me others would find me who are seeking guidance and help. Come they did. I began emailing inspirations, I started my Facebook page, I became a Reiki Master, I started my newsletter here and finally became an Ordained Minister as messages come to me from the Divine during Reiki sessions, yoga classes, life coaching and basic interactions with others. I became a member of a group of healers, and having had our first healing clinic last weekend, we are excited and eager for our next one. In this awakening, I’ve also learned of many alternative methods of healing, lifestyles and beliefs. As I continue to move forward, I continue to learn and grow, in turn I am able to share more of my experiences and wisdom. All of this has happened over the course of my lifetime, speeding up over a decade ago. Yes, speeding up is a decade of time. With persistence, my spirit guides have led me to where I am today. With persistence, I’ve kept moving with positive thoughts, feelings and actions. One small step at a time. You, too, can do anything you desire with persistence! Be like the water, and over time, soften any obstacles & wash away what’s in your way to SHINE! P.S. In need of guidance on persistence? Please contact me on Facebook private message, or email me at heather clang@yahoo.com. Thank you, Tammy! You are too kind! Love & Light my beautiful soul SiStar! Pingback: What's Your Five Year Plan?